East Village Association | West Town Chicago: Where does your food come from? By simply living in East Village, we have all made an implicit gesture toward sustainable living. Living in an established close-in urban neighborhood  well served by public transit, recycling pickups and local businesses  reduces our collective “carbon footprint” to a level significantly smaller than that of a similar sized suburban community. After installing insulation and setback thermostats, and weatherizing our doors and windows, what more can we do? The next logical step is to take a close look at where our food comes from. Food production is incredibly energy intensive, using petroleum derivatives in every step from field to table. Not only are vast quantities of petroleum used to produce fertilizer (who knew?) and power the equipment used to harvest crops, significant quantities are consumed in the processing, refrigeration and transportation required to get it to its destination. Did you know the ingredients of a typical meal have traveled an average of 1500 miles to your table? There are many reasons that our food production system has come to this. Government policies have encouraged the aggregation of small family farms into large centralized factory farms. Consumers have demanded year-round access to once-seasonal fruits and vegetables. And corporations have developed increasingly complex food processing technologies that have completely broken the linkage between the natural crop and the final food “product” (chicken fingers or buffalo wings, anyone?). The ramifications are dire and immense. As the connection between farm and food was broken, food production has become increasingly linked to the energy sector. Where weather was once the major influence on farming, energy costs now drive food prices. This will only get worse as the production of ethanol ramps up and begins to compete with the food sector for corn. There is nothing any of us can do to change our food production system, but luckily we can partially disengage ourselves from it. We can do this in one simple way: eat locally available, in-season fruits and vegetables. In doing so we not only signal our desire for food autonomy, but we can support local family-owned farms, reduce environmental damage due to our food consumption and eat more healthfully. Chicago is known for its sophisticated food culture. As a result we have a network of weekly farmer’s markets (including a winter market in Logan Square) and there is ‘growing’ interest in urban farming (keep an eye on the Montessori Farm on Wood Street!). 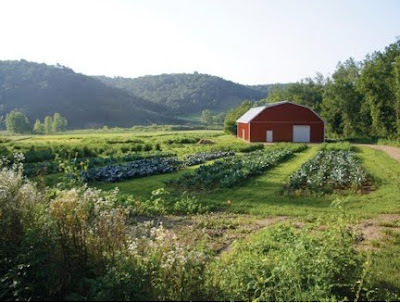 Community Supported Agriculture Coops offer another opportunity to buy locally grown produce. My family hosted the winter drop-off site for Harvest Moon Organics, a CSA based in Viroqua, Wisconsin. Fifteen East Village families picked up their weekly shares of organics produce, eggs, herbs, sun-dried tomatoes, cheese, dried beans and homemade pasta (how cool is that?!) from November through the beginning of February. Being a member of a CSA does not replace the need to go grocery shopping, but it does ensure that a fresh supply of locally grown organic produce is available on a weekly basis. Each Monday we get a wonderful newsletter from Harvest Moon Organics, with a list of produce, how to store it and great recipes for preparing it. On Tuesday afternoon, the produce boxes are dropped in our backyard at 1128 N. Wolcott. Neighbors stop by through the evening and transfer the produce from the boxes to their own bags and then head home to cook. If you are interested in learning more about Harvest Moon Organics, visit their website: www.harvestmoonorganics.com. You can also read about Harvest Moon Organics, its owners and how they got started in a recent article in the Chicago Reader food issue. The summer share will run for twenty weeks, from June 11 through Oct. 22. A full share (2 adults & 2 children) costs $695, a half share, $450. To sign up online, visit the Harvest Moon site and click the CSA link. In addition to our home on Wolcott, the wine store Lush, at 1412 W. Chicago Ave., is another nearby CSA location. On Friday March 5 it will host a “meet the farmers” party to kick off the summer season. We look forward to having many new members join us.